Rescue workers continue to search feverishly for victims in last week’s tragic mudslide in Washington. As one might imagine, the scope of the devastation is difficult to comprehend without the appropriate context. 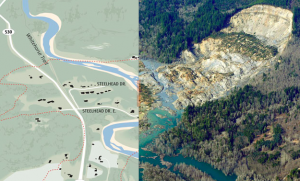 To help with this, The Seattle Times published a post-mudslide aerial photograph superimposed over a map view of the area along with a slider bar to help the reader compare the two images. Reminiscent of the 2012 photos showing the earthquake and tsunami damage in Japan, the mudslide photo and map image offer a much more informative, and sobering view at one of the state’s most destructive natural disasters. This entry was posted on Wednesday, March 26th, 2014 at 10:19 pm and is filed under MULTIMEDIA EXAMPLES, PHOTOJOURNALISM. You can follow any responses to this entry through the RSS 2.0 feed. Both comments and pings are currently closed.